Orders may be emailed, faxed or mailed to JP Display. Please refer to the Payment Policy sheet of your Exhibitor Kit for payment information. All orders must be paid for in advance of delivery or the performance of services. JP Display requires a credit card authorization on file for each exhibitor using JP Display services. Please notify your company representative, who will be at the show, of our payment policy. It is also helpful for your representative to have a copy of the completed order forms, you submitted to JP Display to eliminate confusion for referenced purposes. All questions regarding the convention’s policies, space assignments, display limitations, and event schedule should be directed to your show producer. Please NOTE that that there are different CANCELLATION POLICIES depending on what you are ordering, so pay close attention to these policies. JP Display will be unable to adjust invoices after the close of the show. The Exhibitor Kit you received from your show producer will also have auxiliary forms for Telecommunications for the venue where the show is. Please scroll below for services that JP Display offers. JP Display requires payment at the time of order for all services. JP Display also requires that all exhibitors using JP Display provide a credit card authorization with their initial order. The credit card authorization will be used to cover all services not paid for by the initial payment and balances left unpaid at the closing of the show. This may include: labor, material handling, and other services. JP Display accepts the following: Check, Visa, MasterCard, American Express, and Discover card. Payment in full is required prior to completion of move in. JP Display will accommodate requests for third party billing, however, the responsibility for all payments is the responsibility of the exhibitor, JP Display reserves the right to contract collection action against the exhibitor if the designated third party does not meet the payment requirements (To designate an authorized third party billing agent see the payment calculation form in your Exhibitor Kit). Due to expenses incurred by JP Display in providing certain services, some items and services are subject to cancellation/re-stocking fees. More information is available on the individual order forms in your Exhibitor Kit. Failure to pay within the terms of this Payment Policy will cause service charges to be assessed on all unpaid balances. The service charge rate is 1.5% per month or 18% per annum. In the event of default the Exhibitor (customer) agrees to pay all costs of collection, including attorney fees and court costs. JP Display can provide faster, more efficient service to exhibitors who place orders early. For this reason we offer a discount rate to those who place orders prior to the stated deadline. Full payment must be received with your order if you wish to receive this discount. Orders charged to JP Display accounts do not qualify for discount rates. All orders placed after the order deadline, and at the show will be charged regular prices. All orders cancelled at show site, which have not been delivered will be charged at 50% of the original price. All orders cancelled after delivery will be charged at full price. A service charge of $25.00 will be assessed to individuals or companies for return checks. JP Display understands how important it is to have a successful experience at your exposition. Whether it’s your first show or you’re an experienced exhibitor, we are here to assist you every step of the way—from start to finish. 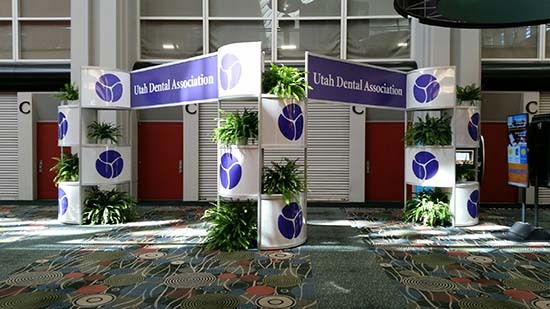 Our goal is to assist you in every aspect of planning to insure your exhibit experience is pleasant and trouble-free. We know the exhibiting preparation starts before you’re at show site, so please take a few minutes to familiarize yourself with our products and services. Please complete the "Electrical Order Form" form in your Service Kit you received. When ordering electrical power check the UL rating plate on each electrical item you are using in your booth. Add and total the voltage requirements for all electrical items. If the total requirement is 475 watts, order 500 watts of power (N/A to 208 phase outlets). The power used CAN NOT EXCEED the maximum power ordered. Exhibitor agrees to all terms and conditions contained on this form. Contract will be considered executed upon receipt of signed document and payment. No orders are received without payment. Cancellation policy; 50% refund applies to orders less than 20amps / 120 volts cancelled from move-in through show opening. No refunds available after show is open. All electrical in island booths will be adjusted to a 1 hour minimum electrician labor. ELECTRICAL LABOR IS REQUIRED on all motor and machine hookups which require more than 120 volts or 20 amps. Any concealed wiring or under carpet wiring must be installed by JP Display electricians. Minimum 1 hour move-in (connect) and ½ hour move-out (disconnect). Overtime rates apply to all work performed before 8:00 a.m. or 5:00 p.m., Sat., Sun. & Holidays. For Outlets requiring 24 Hour service, the Price is DOUBLE THE RATE of the outlet ordered. For Dedicated Circuits, the Price is DOUBLE THE RATE of the outlet ordered. JP Display may not be held responsible for damage or loss of equipment, software, or revenues due to power failure or voltage fluctuations beyond our control or due to temporary conditions or loose connections. For your protection, you should install surge / over-under voltage protections on your computer or other voltage sensitive equipment as you deem necessary. Please complete the "Carpet Order Form" in your Service Kit you received. JP Display offers eight (8) different carpet colors for your booth. Please remember to fill in your company name and booth number. Thank you. Please complete the "Furnishings Order Form" in your Service Kit you received. 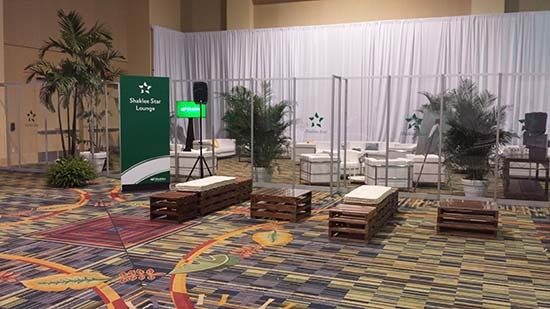 JP Display offers 4', 6' and 8' display and tall tables with or without skirts. In addition, JP Display also offers round cabaret tables and chairs as needed. Please remember to fill in your company name and booth number. Thank you. Please complete the "Accessories Order Form" in your Service Kit you received. JP Display offers visqueen, double face tape, clear tape, duct tape, stanchions, waste baskets, easels, garment racks, coat racks, glass showcases, tackboards, pegboards, and literature racks. In addition, JP Display also offers upright poles w/base and drapery backgrounds. Please remember to fill in your company name and booth number. Thank you. Please complete the "AGAM Order Form" in your Service Kit you received. JP Display offers AGAM Exhibit Booth Packages which includes Installation & Dismantle of Exhibit Standard Carpet with vacuuming, two (2) Arm Lights per 10’ section, Custom Header with Company Name & Logo. Jp Display also offers background fabric, carpet colors and custom headers, see AGAM Order Form. Services not cancelled at least 72 hours in advance will be charged at 100% of the original amount. Please bring any discrepancies to our attention at the service desk. JP Display will be unable to adjust invoices after the close of the show. Please remember to fill in your company name and booth number. Thank you. Please complete the "Cleaning Order Form" in your Service Kit you received. JP Display offers vacuuming, mopping and waxing upon request. TO ENSURE YOUR BOOTH IS SHOW READY, SPECIFY YOU REQUIREMENTS ON THE CLEANING ORDER FORM. PLEASE CALL US IF YOU HAVE A SPECIAL NEED. JP DISPLAY IS THE EXCLUSIVE CLEANING CONTRACTOR FOR YOUR SHOW AND WILL HANDLE ALL CLEANING SERVICES ON THE EXHIBIT FLOOR. The cost of vacuuming will be invoiced on the total area of your booth with a 100 sq. ft. minimum. Please complete the "Floral & Plant Decor Order Form" in your Service Kit you received. JP Display offers custom floral services and rental of green foliage & flowering plants. Services not cancelled at least 48 hours in advance will be charged at 100% of the original amount. Please bring any discrepancies to our attention at the service desk. JP Display will be unable to adjust invoices after the close of the show. Please complete the "Sign and Graphic Order Form" in your Service Kit you received. JP Display offers CUSTOM SIGNS & BANNERS AVAILABLE UPON REQUEST: Vinyl, Cling, Backlit, POP Display, Lamination, LOGO REPRODUCTION, and GRAPHIC DESIGN. All Signs and Graphics are digitally produced on white ¼” foam core. Pricing listed is for a single-sided sign to include text / copy and supplied high resolution logo. Please specify background and copy color. JP Display offers eight background and copy colors and position direction for the sign or graphic. Please complete the "General Labor Order Form" in your Service Kit you received. Please complete the information on the form for each day you will require ID labor service. JP Display offers LABOR FOR INSTALL / DISMANTLE. General Display Labor is for all installation and dismantling of exhibits, including signs and floor covering installation. STRAIGHT TIME: 8:00am to 5:00pm Monday - Friday $48 PER HOUR (1 HOUR MINIMUM CHARGE PER USE) Labor thereafter is charged in half (½) hour increments. OVERTIME: Hours prior to 8:00am and after 5:00pm All day Saturday, Sunday and Holidays $72 PER HOUR (1 HOUR MINIMUM CHARGE PER USE) Labor thereafter is charged in half (½) hour increments. SUPERVISION REQUIRED: ADDITIONAL 25% OF TOTAL CHARGE ($100.00 MINIMUM CHARGE) PRICES ARE FOR EACH INSTALL AND EACH DISMANTLE, NOT THE TOTAL TIME. PRICES ARE FOR EACH INSTALL AND EACH DISMANTLE, NOT THE TOTAL TIME. Please complete the "Overhead Sign Hanging Order Form" in your Service Kit you received. JP Display offers OVERHEAD SIGN/BANNER HANGING INSTALLATION and/or REMOVAL OF OVERHEAD SIGN/BANNER HANGING. Service includes High Lift, Certified Lift Operator, Ground spotter, and cabling equipment to support hanging sign or banner, (800 lbs maximum weight load per hang). Please call for a quote if weight is over maximum weight load. OVERTIME: All hours prior to 8:00AM and after 5:00PM / Saturday / Sunday / Holidays. $175.00 PER HOUR (1 HOUR MINIMUM CHARGE PER INSTALLATION AND/OR REMOVAL). ADDITIONAL SIGN HANGING LABORER INSIDE HIGH LIFT REQUIRED CAN BE ORDERED AT THE RATES LISTED ON THE GENERAL LABOR ORDER FORM. PLEASE INDICATE IN THE SPECIAL INSTRUCTIONS AREA BELOW IF REQUIRED. Please complete the "Material Handling Order Form(s)" in your Service Kit you received. JP Display offers to help you handle you materials you are shipping. Determine your material handling cost and add the estimated cost to the Payment Authorization page. MATERIAL HANDLING: Crated, boxed or skidded materials will be received at the warehouse up to 30 days in advance of show or at the show site. The materials will be delivered to the respective booths. Empty containers will be removed and stored until the end of the show as per Fire Marshal requirements. At the close of the show containers will be returned to the original booth. 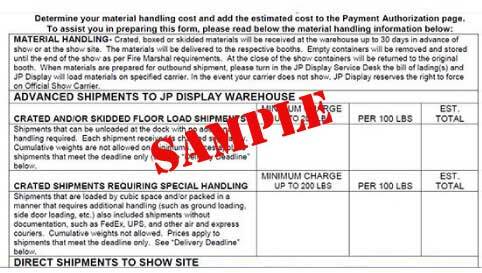 When materials are prepared for outbound shipment, please turn in the JP Display Service Desk the bill of lading(s) and JP Display will load materials on specified carrier. In the event your carrier does not show, JP Display reserves the right to force on Official Show Carrier, which will be added to you bill. Shipments can either be shipped direct to the show site or the JP Display's warehouse, depending on the date of the shipment. 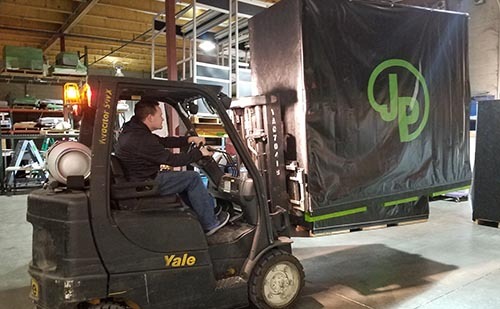 Shipments to JP Display's warehouse are broken into two (2) categories Crated and/or skidded floor load shipments or crated shipments requiring special handling. See the "Material Handling Order Form(s)" in your Service Kit for quotes and dates. Shipments to the show site are also broken into two (2) categories Crated and/or skidded floor load shipments or crated shipments requiring special handling. See the "Material Handling Order Form(s)" in your Service Kit for quotes and dates. For uncrated, loose and shipments requiring special handling, uncrated items, unboxed items, or machinery/heavy equipment. The same pricing conditions apply that are listed on your "Material Handling Order Form(s)" in your Service Kit. Check for quotes, dates and addresses for shipping. In your Service Kit you received there are "Advanced Warehouse Shipping Labels" specific for your show. Check the table of contents for the page number. Simply copy these labels for your use in shipping directly to JP Display warehouse. An example of this label is pictured above. In your Service Kit you received there are "Direct to Show Site Shipping Labels" specific for your show. Check the table of contents for the page number. Simply copy these labels for your use in shipping directly to the Shoe Site. An example of this label is pictured above. Please complete the "Outbound Shipping Form" in your Service Kit you received. 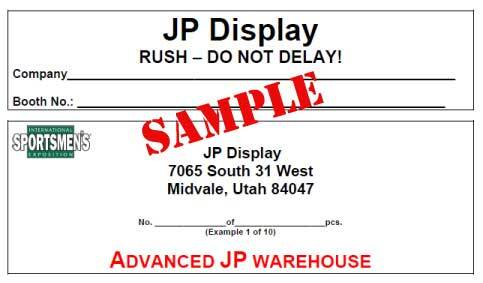 JP Display offers pre-printed outbound shipping labels. OUTBOUND SHIPMENTS WILL REQUIRE A STRAIGHT BILL OF LADING TO RELEASE THE SHIPMENTS TO DESIGNATED CARRIERS. JP DISPLAY WILL BE PLEASED TO PREPARE THESE FORMS FOR YOU IN ADVANCE AND WILL DELIVER THEM TO YOUR BOOTH AT SHOW SITE TO REVIEW AND SIGN. PLEASE TAKE ADVANTAGE OF THIS SERVICE AND COMPLETE AND RETURN THIS FORM. Please make sure you fill out this form in detail and remember to fill in your company name and booth number. Thank you. Please complete the "Carpet Order Form" in your Service Kit you received. JP Display offers exhibitors designated contractor for the show. Rules and Regulations for Exhibitor Designated Contractor (EDC). An EDC is any company other than JP Display, the Official Service Contractor, which an exhibitor may wish to use inside the exhibit hall before, during, or after the show. 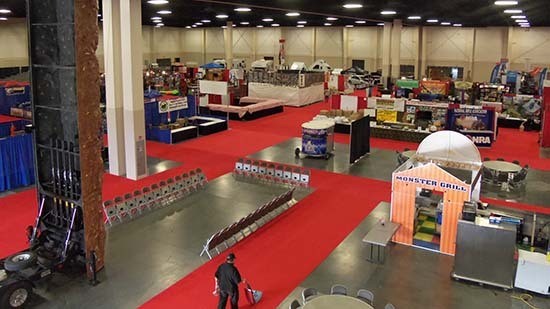 Usually, an EDC is contracted to set or supervise the setting of an exhibitor’s display. An EDC May Not perform any of the following functions: Drayage / Material Handing, Electrical, Plumbing, Mechanical, Booth Cleaning, Booth Security, Floral, Telephone, Food & Beverage Service, and Draping and Decorator Labor. However, an EDC may be contracted to supervise the procurement of the item listed above. An EDC must provide the following to JP Display, no later than 30 days prior to exhibitor move-in. Requests received later than 30 days prior to exhibitor move in will be denied. 1. The "Carpet Order Form" in your Service Kit must be filled out completely and returned to JP Display. 2. EDC must furnish current certificates of insurance naming JP Display as additional insured for both liability and workers compensation. Liability coverage must be at least $2,000,000 aggregate and $1,000,000 each occurrence. Workers compensation coverage must be at least $1,000,000 aggregate and $500,000 each occurrence. Failure to provide proper insurance documentation will result in EDC being barred from the exhibit hall. 3. EDC must provide payment in full for all services ordered from JP Display (Please see Payment Policy Sheet in your “Exhibitor Kit” for more Information). The Exhibitor is ultimately responsible for any charges incurred by its EDC. Any unpaid charges incurred by an EDC will be collected from the responsible exhibitor prior to the close of the show. 4. EDC must confine its activities to the exhibit space of the contracting exhibitor. No storage areas, service desks, or work facilities will be allowed. 5. EDC may not solicit business on the exhibit floor. 6. Exhibit hall, service, storage areas, and loading docks are under the control of the Official Service Contractor (JP Display) and all activities must be coordinated through JP display. 7. JP display accepts no responsibility for damage to any exhibitor material under the control of the EDC or to material that has been left in public areas such as aisle ways, loading docks, storage or work areas, or hallways. 8. EDC employees must identify themselves to JP Display personnel and wear appropriate identification badges at all times. Temporary identification badges will be available from the JP Display service desk if necessary. 9. EDC and its employees will conduct themselves within the governing show rules as established by the show management or association. Such rules may include rules governing the appearance and conduct of workers and during what hours work may be performed. Please check with show management to verify the details of such rules. How do I get an Exhibitor Kit? Your Exhibitor Kit can be downloaded directly from our website. Our Exhibitor Customer Service personnel will provide you with a username and password via email. Once received, log on to www.jpdisplay.us go to Exhibitor Services tab and click on to Exhibitor Kits. Click onto your show and fill in your username and password to download your kit. Please Read Your Exhibitor Kit. Please thoroughly read the contents which will have all of the information pertaining to your show and should answer the majority of your questions. If you did not receive the email with your username and password please call our Exhibitor Customer Service at 801-523-7083 or email to: orders@jpdisplay.com to assist you. Is the Exhibit Hall carpeted? The Show Information page (second page in the Exhibitor Kit) will let you know if the show site is carpeted as well as the show color(s). If the show site is not carpeted and you would like your booth carpeted, you can order carpeting through us. Please complete and return the "Carpet Order Form." Your carpet will be installed by the first day of move-in. What is included in my booth package? Your booth package information can be found on the Show Information page of your Exhibitor Kit. Should you require additional equipment, furnishings, accessories, etc., please review the Exhibitor Kit for the appropriate order forms. If you don’t see what you need, call us and we will do our best to accommodate you. Do I need to fax over all the forms in the Exhibitor Kit? You only need to fax over the forms for the equipment/services you require along with the Payment Authorization Form. Bring a copy of your order forms to the show with you so you can verify that you have received everything you ordered. 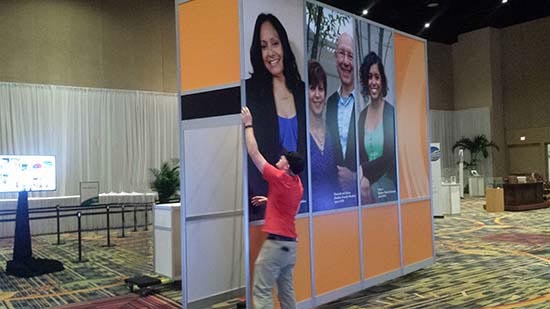 How do I ship exhibit materials to my booth? JP DISPLAY provides Freight and Material handling services (drayage), which includes receiving and storing your exhibit materials for up to 30 days in advance, transportation to show site, delivery to your booth, handling and storage of empty containers during the show, return of empty containers at the close of show to your booth, and the removal of materials from the booth for reloading onto outbound carriers when the show closes. You have two options for shipping your advance freight—either to our warehouse or directly to show site. Please note that our Material Handling Order Form and Payment Authorization Form must be received prior to the arrival of your freight or additional charges may apply. These forms can be found in your Exhibitor Kit or call our customer service department to obtain additional copies. Please note that drayage does not include the cost to transport your exhibit materials to our warehouse after the close of the show from the show venue. Which is better? Shipping to your warehouse or directly to show site? Material handling fees are typical lower in cost to ship directly to show site. 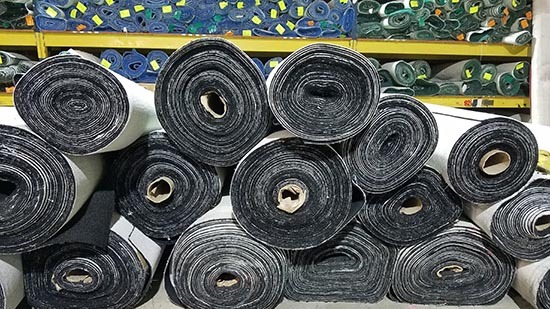 Shipping to our warehouse allows more flexibility in when your materials arrive. Materials will be accepted at our warehouse 30 days prior to the show and up until the deadline date listed in your Exhibitor Kit. If shipping directly to the show site, your materials must arrive during exhibitor move-in dates. Shipments should not be scheduled to arrive earlier than exhibitor move-in, as the facility will not have the capability to receive shipments and may refuse them prior to installation of the show. Date and times of Exhibitor move-in are listed on the second page of the Exhibitor Kit Material Handling Order Form and on the cover page of your Exhibitor Kit. Pre-address Advanced to Warehouse & Direct to Show Site labels are included in your Exhibitor Kit. 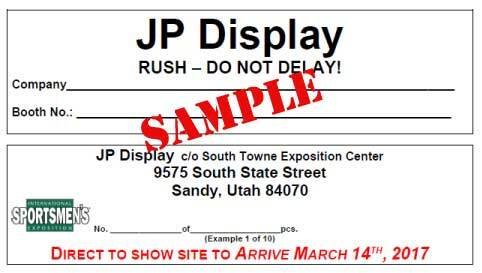 All shipments must be labeled c/o JP DISPLAY with your booth number and show name. How do I estimate my Material Handling charges? Charges will be based on the weight of your shipment. Each shipment received is considered separately. The shipment weight will be rounded up to the next 100 pounds. Each 100 pounds is considered one "cwt" (one hundred weight). There is a 200 pound minimum charge for each shipment. Shipments weighting less than 50 lbs will be charged for each package received at a lesser rate than materials weighting over 50 lbs. What happens to my empty containers during the show? "Empty Labels" can be obtained at the JP DISPLAY Exhibitor Service Desk. Place your "Empty" labeled containers near the aisles and they will be picked up periodically and stored during the show. Please make sure that you have removed all necessary items from your containers as they will not be accessible during the show. The empty containers will be returned to the booth, in random order, at the close of the show. Please note this process may take several hours depending on the size of the show. How do I ship my materials after the close of the show? You must have a completed Bill of Lading in order to ship materials from the show. All pieces must be labeled individually. Bill of Ladings and labels are available at the Exhibitor Service Desk. To save time, complete the outbound shipping paperwork in advance. After materials are packed, labeled and ready to be shipped, the completed Bill of Lading must be turned in at the Exhibitor Service Desk. If you prefer to use a carrier different from our recommended carriers, you must arrange your own outbound shipping by calling your designated carrier with pick-up information. Please refer to the Show Information page in your Exhibitor Kit for specific dates and times. In the event your selected carrier fails to show on the final move-out day, your shipment will be rerouted to JP DISPLAY'S Logistics carrier of choice. YES—Make certain all your materials are properly insured while in transit to and from the convention site and for the duration of the convention. This usually can be done with "Riders" to your existing insurance policy. What do I do when I arrive at show site? When you arrive at show site, you should go to your booth space and check that everything is there. Check each item against your shipping information. Also, make sure that if you ordered electrical, that is has been installed. If anything is missing or you want to order any additional items, please go to the Exhibitor Service Desk. If you ordered labor, check in at the Exhibitor Service Desk at the requested time to pick up your laborers. What should I bring with me to the show? As a reminder of what you ordered, bring copies of all of your paperwork and documentation. Also, bring copies of what you have shipped, how it was shipped and any tracking numbers. As well, bring information on outbound shipping, your carrier and address to be shipped to. Lastly, bring an exhibitor tool kit. This should include items such as scissors, Velcro, tape, wire, stapler, safety pins, band aids, markers, pens, and other MacGyver quick fix needs. When will my items that were shipped in advance to the warehouse arrive in my booth? Items shipped in advance to the warehouse should be in your booth by the time you arrive on the first day of move-in. If all of your items are not in your booth by the first move-in day, take your tracking and shipping information to the Exhibitor Service Desk. We will determine whether or not the shipment has been received. When will the items I ordered arrive in my booth? If you ordered carpet it should be in your booth on the first day of move-in. Electrical, display tables, furnishings, and other accessories should also be placed in your booth. Chairs are delivered prior to show opening. As well as vacuuming orders will be completed prior to show opening(s). Is it necessary to check-in at the on-site Exhibitor Service Desk? There is no need to check in with the Exhibitor Service Desk, however, if you have any questions or need to order additional furnishings, schedule labor or arrange outbound shipping, please do not hesitate to stop by and our service representatives can assist you. When do I receive my receipt for equipment and services? You will receive a receipt for all equipment and services charged to your account via email prior to the close of the show. If you do not have access to your email at show site please do not hesitate to stop by our Exhibitor Service Desk for a print out of your receipt. JP DISPLAY has opted to emailing in consideration to your attention to your attendees and our attention to green incentives. When do I need to be sure to vacate my booth space? Please refer to the Show Information page of your Exhibitor Kit for the date and time the show needs to be cleared. Audio/visual support such as television monitors, VCRs, or taped music. A supplier of audio/visual equipment and services. An order for services sent to the service contractor prior to the installation date. Compare with Floor Order. Fees associated with advance orders, which typically include discounts when paid in advance. A bona fide representative with proper credentials from the party represented. Ocean Bill of Lading, Through Bill of Lading. A walkway intended for audience movement through an exposition or exhibit. Carpeting installed in trade show aisles. Signs, usually suspended, identifying exposition aisles by number or letter. The process of erecting an exhibit from its components. Also called Installation, Set Up. Those persons who visit an event that are not exhibiting or connected with the event itself. A light source that illuminates translucent material from behind. The panels at the rear of an exhibit. An exhibit that is back-to-back with another exhibit or against a building wall. A partition designed to control light, air, sound, or traffic flow. A suspended panel used as a decoration or a sign, usually made of fabric or paper for temporary use. Uncrated goods covered with blankets or other protective padding and shipped via van line. Also called Pad Wrap. A scale drawing of booth space layout, construction, and specifications. A storage area for empty crates and contractor materials. An area made up of one or more standard units of exhibit space. The amount of floor space assigned to an exhibitor. A number assigned by show management to identify an exhibitor's floor space. Staff members assigned by an exhibitor to work in an exhibit. The dimensions of the floor space contracted by an exhibitor. Usually sold in 10' x 10' increments. The level at which a discount is given for a volume order. Computer-Aided Design/Computer-Aided Manufacturing. A pricing term indicating that these charges are included in the stated price. Hundred weight. A measurement used for shipping exhibit properties. Usually 100 pounds. A skilled worker used to uncrate, install, dismantle, and recrate exhibit properties. Double-sided tape used to adhere the edge of a carpet to the floor. A transportation line moving freight. Usually a van line, common carrier, rail line, or air carrier. Also see Common Carrier. 1. The fee charged for transporting freight. A document certifying that merchandise was in good condition immediately prior to its shipment. Equipment used to lift people to a given height. A carrier-issued receipt indicating that transported merchandise was received in apparent good condition. Compare with Foul Bill of Lading. A contract between an employer and a union specifying the terms and conditions for employment, the status of the union, and the process for settling disputes during the contract period. Also known as Labor Agreement, Union Contract. A pillar in an exposition facility which supports the roof or other overhead structures. Usually shown on a floor plan as a solid square. An itemized list of shipped goods. A transportation company moving people or goods. For exhibit freight, the carrier usually accepts only crated materials and consolidates the properties of several customers into one shipment bound for the same destination. A person to whom goods are shipped. A delivery of merchandise from an exporter (the consignor) to an agent (the consignee) under the agreement that the agent will sell the merchandise, receive a commission, and remit the net proceeds to the exporter. A person who sends freight. A drawing which gives detailed diagrams and instructions for building an exhibit. An exhibit space with exposure on at least two aisles. A skilled worker who provides services at the exposition facility. Also called Labor. An itemized list of the contents of a crate. An aisle at a right angle to a main aisle. Literally, length x width x height. With reference to booth space, the placement of exhibit properties at a height of 8 feet or more above the leased area. Also a measurement used in determining shipping costs for van lines. A display designed and built to meet the specific needs of an exhibitor. A person or company licensed to enter and clear goods through Customs. A report submitted by an exhibitor to a freight company or drayage contractor itemizing damage to shipped goods. Temporary post used during installation to help support the weight of an overhead structure. Time when a worker is unable to perform duties due to factors beyond his or her control. A shipper's stated dollar value for the contents of a shipment. An individual (skilled craftsperson) or company (a contractor) providing services for a trade show and/or its exhibitors. Length x width x height divided by 194 for domestic shipments, or divided by 166 for international shipments. To take apart an exhibit. Also known as Take-down, Teardown. A company which fabricates exhibits. Exhibit construction specifications endorsed by major exhibit industry associations. Also the specific set of rules that apply to an exposition. A platform where freight is loaded onto and removed from vehicles or vessels. A two-storied exhibit. Also known as Multiple Story Exhibit. A craftsperson who installs drapes, fabric, and special decor. A company responsible for handling exhibit materials at a trade show. A form completed by an exhibitor requesting handling of materials. Double Time Labor. Work performed on overtime and charged at twice the published rate. A stand for displaying objects. A company hired by show management to provide electrical services to exhibitors. Scaled drawings depicting front and side views of an exhibit. An exhibit space with aisles on three sides. A contractor appointed by show management as the sole provider of specified services. The rental of a carrier's entire cargo space by one shipper. Company responsible for designing and constructing exhibit booths. A guide for exhibition attendees which lists exhibitors and exhibit locations. The area(s) within an exposition center where exhibits are located. Person in charge of a company's exhibit program. A package of information which contains all rules, regulations, and forms relating to an exhibition, provided to exhibitors by show management. Also called Service Kit. To send or transport goods out of one country for sale in another. An individual or company that brings together buyers and sellers for a fee. A company that transacts manufacturers' export business for a fee. A company that buys products directly from manufacturers, then packages the merchandise for resale under its own name. A company that buys foreign merchandise for resale in its own local market. The set of regulations which govern a given trade show. A notation on floor plans indicating the locations of fire hose cabinets. Free On Board (vessel). A price quotation under which the exporter quotes a price that includes delivery of the goods on board the vessel. When FOB is used in conjunction with an inland shipment, the expenses up to the point specified are covered by the seller, but shipping expenses after that point are charged to the buyer. The construction of an exhibit. The use of cut glass fibers to display colored light. A door designated for emergency egress, which must be kept clear of obstructions. An aisle that must be kept clear of obstructions to allow emergency egress. Term used to describe a finish which coats materials with a fire-resistant (not fire proof) cover. An individual representing show management who is responsible for the exhibition area. Method used to mark booth spaces. Order for services placed after exhibit installation has begun. Compare with Advance Order. A map showing the size and locations of exhibit spaces. A utility box recessed in the floor containing electrical, telephone, or plumbing connections. Rigid foam covered with heavy paper stock used for mounting signs, art, etc. Motorized vehicle used to load, unload, and transport heavy items. A carrier-issued receipt indicating that transported merchandise was damaged when received. Compare with Clean Bill of Lading. Minimum work period for which union labor must be paid. A port designated by the government of a country for duty-free entry of any non-prohibited goods. Freight Exhibit properties and other materials shipped for an exhibit. 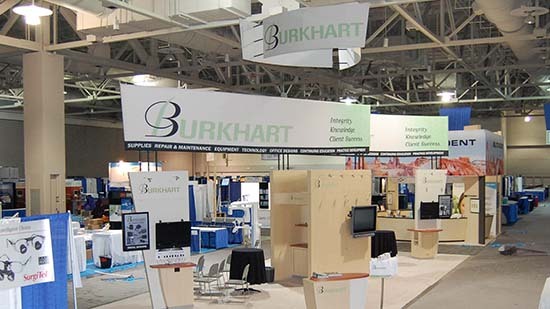 The area where inbound and outbound exhibit materials are handled at a trade show. A shipping company which handles export shipments for a fee. International term referring to the "aisle". General Agreement on Tariffs and Trade. A multilateral treaty intended to reduce trade barriers between the signatory countries and to promote trade through tariff concessions. Show management appointed company providing services to a trade show and/or its exhibitors. Also called Official Contractor. Compare with Exhibitor Appointed Contractor. A photo, copy panel, or artwork applied to an exhibit. A network of structural members, electrical conduits, and other support systems on a pattern of centers. General term used for an exposition facility or the exhibit area within a facility. Small hand-propelled vehicle used for transporting small loads. 1. Work order for labor or services. 2. Drayage contractor's record of materials received or shipped. A type of exhibit construction in which walls are made of a solid material, rather than fabric. A sign or other structure across the top of an exhibit. International term referring to "rent" a service or product. A contract clause that relieves one party of responsibility in the event of a legal claim. Installation & Dismantle (of an exhibit). Also known as Set Up and Take-down. A contractor hired by an exhibitor to perform trade show services independently of show management appointed contractors. Also called Exhibitor Appointed Contractor, EAC. An exhibitor's unauthorized use of floor space outside the leased booth area. A contract between a shipper and transportation company used when transporting goods overland to an exporter's international carrier. Compare Ocean Bill of Lading, Through Bill of Lading. An exhibit that is constructed in a continuous line along an aisle. Also called Linear Display. The process of setting up exhibit properties according to specifications. Also called Assembly, Set Up. A company responsible for supervising and coordinating workers who install and dismantle exhibits. The set up and take-down of exhibits. Also called I & D.
Total amount of equipment available for a show. A display with aisles on four sides. A special-purpose crate with hardware to secure exhibit properties in place to prevent shifting during shipment. A person in charge of supervising and coordinating workers. A distribution point for electrical power. An exhibit with separate components that must be assembled on-site. Contracted workers who perform services. Also called Craftspersons. 1. Method of securing union employees. 2. Time specified for labor to report (as in a 7 A.M. call). 3. Minimum amount for which labor must be paid. Exhibit hall location where exhibitors may place orders for labor. The form used by exhibitors to order labor. The process of bonding two or more substances together. A manual or automated system used to conduct follow-up activities for sales prospects resulting from a trade show. The rate charged for freight weighing less than the minimum weight for a truckload. A document issued by a bank at the request of a buyer of goods which authorizes the payment of a specified amount of money to the seller when certain terms are met. A legal term referring to responsibility for damages or injuries. The amount or type of illumination in an exhibit or exhibition hall. An enclosure which contains lighting underneath a translucent facing material. Used to back-light signs or graphics applied to the face. An exhibit that is constructed in a continuous line along an aisle. Also called In-line. An area within an exposition facility where freight is received and shipped. A secure storage area within an exposition facility. A specific symbol chosen to represent a company. Usually comprised of stylized type alone or in conjunction with graphic art. A term applied to electrical currents of 24 volts or less. Usually used in animation and specialty lighting. A lot where trucks gather for orderly dispatch to show site. To cover for painting or protection. A cloth used to cover storage or other unsightly areas. An exhibit constructed with interchangeable components designed to be set up in various arrangements and sizes. The date specified by show management for dismantling exhibits. Combining two or more types of audio/visual support in a presentation. The total amount of leased booth space in an exposition facility. A contract between a exporter and an international carrier for transport of merchandise to a specified foreign market. Compare Inland Bill of Lading, Through Bill of Lading. Show management appointed company providing services to a trade show and/or its exhibitors. Also called official services contractor. Compare with Exhibitor Appointed Contractor. A reference to the exhibit location. Also called At-site. Floor order placed at a show site. A designation for work performed outside the hours specified as normal working hours. Usually work performed on overtime is charged at a substantially higher rate. A document prepared by a shipper itemizing contents of shipment and including other information needed by the carrier. Uncrated goods covered with blankets or other protective padding and shipped via van line. A prefabricated exhibit composed of connected rectangular panels of various sizes. A panel made of compressed, glued wood chips. The trade name for a type of hardboard with perforations at regular intervals. Usually used for hanging items. An exhibit with aisles on three sides. A booth space on a outside wall. Tubing covered with draped fabric to make up the rails and backwall of a trade show. A demonstration area, usually higher than the surrounding floor. A lightweight display unit that can be moved without a forklift. A movable unit having multiple electrical outlets. A pre-built exhibit ready for installation. An article submitted to the media for publication. Usually announcing news about a product, company, or individual. 1. Exhibit Producer: An individual or company which designs and/or builds exhibits. 2. Show Producer: An individual or company which manages trade shows. An invoice sent to a buyer prior to the shipment of merchandise which provides detailed information about the kinds and quantities of goods to be shipped. A carrier-assigned number used to designate a specific shipment. Four electrical outlets in one box. Metal or insulated rubber tubing used to channel electrical wires. A low wall used to divide exhibits. A technique of using a light source to illuminate a translucent image from behind. Also called Back-lighting. A video technique in which images are projected on a screen positioned between the projector and the audience. The process of repairing or reconditioning an exhibit to extend its life span. An electrical device used to produce programmed effects by interrupting the flow of current. Forms provided by show management to permit the removal of materials from an exhibition. 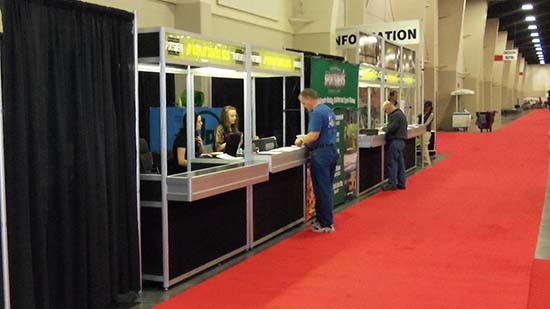 A complete booth package offered to exhibitors on a rental basis. Side panels joined perpendicular to the backwall. A device used to regulate lighting intensity. Also known as Dimmer Switch. A skilled worker responsible for handling and assembly of machinery. A state where no person can be denied the right to work because of membership or non-membership in a labor union. A platform for people or materials. A diagram in model form. A motorized platform used to lift people to a given height. An electric or gas cart used to transport people and materials. Fabric which is opaque when lighted from the front and transparent when lighted from the rear. Cages provided to exhibitors for locking up materials. A display which uses the shipping case as an integral part of the exhibit. The location at which exhibitors order services from show management. A packet of show-related information and order forms provided to exhibitors by show management. Also called Exhibitor Kit. The process of erecting an exhibit from its components. Also called Assembly, Installation. Drawings which give detailed instructions for the installation of an exhibit. A reusable container for transporting exhibit materials. A wooden container for transporting exhibit materials, which may be designed for a single use or custom built for extended reuse. Time specified for the closing of an exhibition and beginning of dismantling. A company or individual responsible for providing draping, carpeting, and signage services for the trade show and its exhibitors. The organizer and operator of an exposition. The show management office at an exposition. The show management appointed photographer for an exhibition. An individual or company which manages trade shows, including leasing the exposition facility, hiring official contractors, and promoting the show. The general rules and regulations governing a specific trade show. A process used to seal materials in transparent plastic. A low divider wall, usually pipe and drape, used to divide one exhibit space from another. A frame on a stand into which a sign can be inserted for display. A method of creating graphics with a reusable stencil. A low wooden frame used to support heavy objects or groups of materials for easier handling. Usually used as a platform for objects moved by forklift. Also called Pallet. Decorative covering around tables and risers. A lowered portion of a ceiling. The area occupied by an exhibitor in the exhibition hall. The cost per square foot of exhibit area. Applies to exhibit shipments requiring extra labor, equipment, or time for delivery to exhibit space. A lamp that provides a defined circle of light. A location used for demonstrations. Posts used to support signage or other elevated objects. Straight Time Labor. Work performed during normal work hours at the standard rate. Compare with D.T. Labor, Overtime. A predesigned display modified for a particular use by the exhibitor. An individual or company retained by a general contractor to provide services. An exhibit designed for use on the top of a table or similar surface. An individual or company hired to work in an exhibit to greet visitors, demonstrate product, or stage a performance. A date set by show management for the arrival of freight at a trade show. Usually shipments received before or after this date are assessed a penalty charge. Shipping charges for various types of cargo. The dismantling of an exhibit. Also known as Take-down. Tubing in which one section slides inside another. Used to support drapes. Freight handling or dock area. Electrical cable with a continuous ground wire in addition to a positive and a negative wire. Bill of Lading, Ocean Bill of Lading. A form of billing in which a consumer is charged for labor costs (time) and materials. Broadly used as the international term for an exposition. An exposition related to a particular industry or group, and open only to the members of that group. The movement of visitors through an exposition or exhibit. A type of electrical plug that connects by twisting together. Underwriters Laboratory. An organization which grants electrical ratings. An organization of workers formed with the purpose of protecting workers' rights and increasing bargaining power with an employer on such issues as wages, hours, and benefits. An on-site union official elected by coworkers to oversee a particular union's work in a facility and resolve any disputes over union jurisdiction. Also known as Shop Steward. Value Added Tax. A tax that has been added to the overall price of a product reflecting the value added to the product by processing. An overhead banner typically used as a light baffle. The trade name for a fabric closure with two components: hooks and loops. The two components adhere when pressed together and separate when pulled apart, allowing repeated use. A construction product used for panels which are temporary. A receipt issued by a warehouse for goods received for storage. The removal of trash from an area or building. A charge assessed for handling cargo at a pier. The period of paid time which begins when craftspersons are turned over to an exhibitor and ends when they are released by the exhibitor. The booth two hours before the show opens! This listing is has been created by and is provided courtesy of Exhibitornet.com.